Do you think Concept Maps for nursing students are pointless? That’s what I believed way back when I was in nursing school! My first exposure to concept maps, also known as mind maps, was in my Fundamentals textbook…and I was less than impressed. Back then, I though concept mapping was just a clunky way to take notes. The examples of nursing concept maps in my text were oversimplified to the point of common sense. It would have been quicker (and easier!) to write out “regular” notes than it would be for me to draw a concept map about the same info. Before I was a tutor, Concept Mapping seemed like a waste of time. But then…I became a professional nursing tutor. And I suddenly began to recognize the HUGE untapped potential that concept maps had for training students (and myself!) to think like a nurse. Nurses think in Concept Maps. 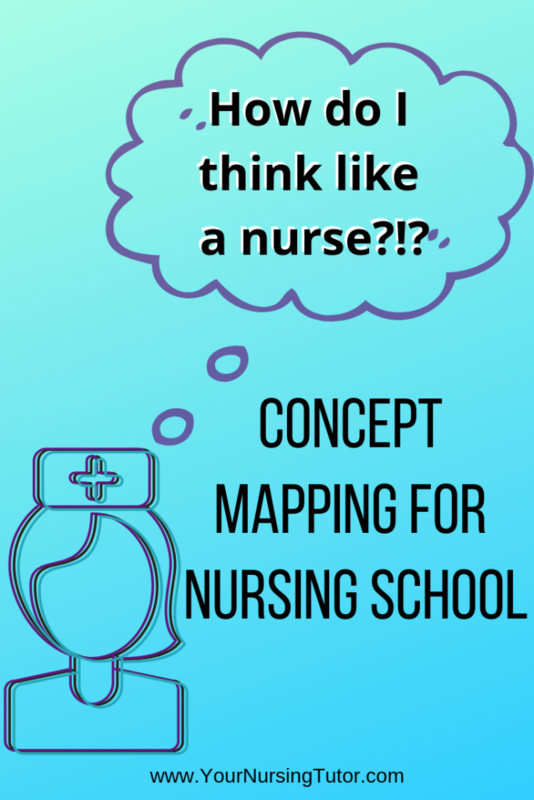 In fact, concept mapping is the best way that I have found to describe what it means to “think like a nurse.” So if you haven’t learned how to think in concept maps (at least, in the way that I teach them…), then you haven’t learned how to “think like a nurse”, either. That’s why ALL nursing students will benefit from learning how to properly create a concept map. Concept maps in nursing school should be more about how you think, rather than what you think. That’s why they are a critical study tool for nursing students, even if you don’t have to do them for your classes. When used properly, Concept Mapping become the training that takes you step-by-step through exactly how nurses think. And once you put that complex thought process down on paper, you will quickly learn how to do it automatically when you’re thinking for yourself, too! First off, let me clarify: the problem is not with concept maps…it’s with the way that they are taught and used in nursing school. Consider the horrible way that I was taught about concept maps in nursing school…and my experience is not unique. My teacher basically told us to make sure we read the concept map examples in our textbook, because they were a helpful tool for nursing. And that was the last we heard about it from her. She never told us why they were helpful. She never told us how to use them. And so (unsurprisingly), I never used them. Looking back, I definitely don’t blame my professor. She didn’t even know why or how to use them herself! Concept maps are a very misunderstood tool by both students and educators. That’s why they end up being poorly taught (or not taught at all). And then students never have the opportunity to use this powerhouse technique to succeed. I can still remember sitting in my Psych Nursing class listening to lecture. I can’t remember exactly what she was teaching on that day, but I clearly remember the results. The professor started the lecture explaining Illness A, and ended the lecture with a story about Patient Z that she had worked with years earlier (who did not have Illness A, btw…). When she finished her story, she paused and looked at the class expectantly. She was greeted with a room full of blank stares. Nineteen students who were wondering why in the world she had just told that story. Nineteen brains wondering what in the world it had to do with Illness A. 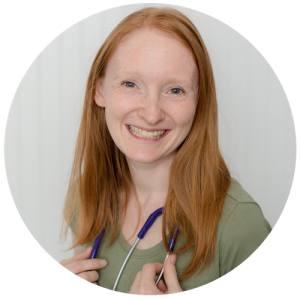 Because of my background in psychology,I was student #20…I knew exactly how Patient Z’s story connected back to Illness A, AND what it had to do with psych nursing. But it slowly dawned on me that the rest of my classmates assumed that our professor was rambling on a tangent that had absolutely nothing to do with the day’s topic…how did this disconnect happen?? I finally realized that in order to understand the importance of concept maps in nursing school, educators have to analyze how THEY think themselves. And that’s some tough introspection to do! Over time, I used that experience to recognize that my professor had been using her internal concept map to easily travel from Illness A to Patient Z! To her, the connection was clear because all of the information was connected by her internal concept map. I was able to follow along in that situation only because I already had a ton of previous psych knowledge from my Masters in Clinical Psychology. My classmates, on the other hand, were still missing critical pieces of that psych knowledge. Overall, I realized that we weren’t being trained to study strategically so that we could easily find and correct our individual knowledge gaps. And to make things even more difficult, nobody was teaching us to develop our critical thinking skills so that we could maximize the knowledge we already had! A proper understanding of how to use Concept Maps for nursing would have fixed all of that. Thinking like a nurse is messy. That’s why concept maps (when done properly!) are so useful at illustrating how nurses think. They aren’t linear, so it’s easy to combine multiple topics into a single concept map to see how different topics can be related. For example, have you ever thought about what Diabetes Mellitus and Gestational Diabetes have in common? If you learn how to create a good concept map, you would find studying and remembering information about both those disorders so much easier! As a you learn to master concept maps, you will discover that they begin to flow more naturally, and your mind will automatically start to think in concept maps. You will also find yourself more easily following your professors lectures, and you’ll feel confident identifying what those NCLEX-style questions are really testing you on. 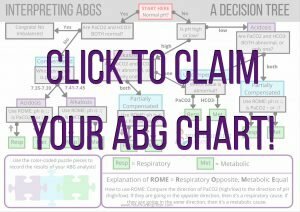 What do YOU think about concept maps for nursing school? Do you think they will be helpful, or a waste of time?